Wasps will usually be more of a nuisance from July, as the honeydew they eat during the rest of the summer in getting in short supply. so they need their sugar fix elsewhere, so they come after your picnic and drinks. 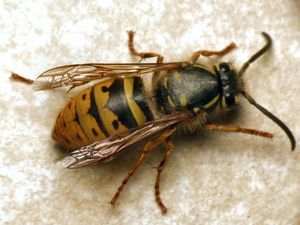 Unlike the bees who die after they have stung you, wasps can sting over and over. If annoyed (which doesn't take much) they will attack, we can safely remove a wasps nest, as long as they are not in a cavity wall. In this case they need to be dealt with differently. Below is what we call a queen cup, this is where the new queen will hibernate through the winter. This will only take a few weeks to become the size of a football if the conditions are ok, when she wakes in the spring. 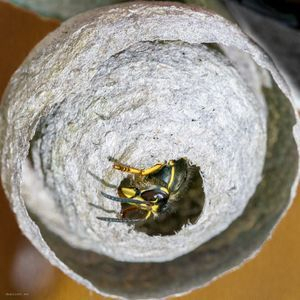 Please contact us for safe removal if you find a wasp nest.